(Nanowerk News) Scanning-probe microscopes (SPMs), major enabling tools underlying scientific discovery at nanometer length scales, are applied across a wide range of fields. These instruments—essentially sharp tips affixed to nanoscale robotic arms—have captured the imagination of scientists and the public alike in their ability to image and manipulate individual atoms and molecules. Since their invention nearly three decades ago, SPMs have proved to be highly versatile tools capable of operating in a wide variety of conditions. For this reason, the potential to study the structure and structural dynamics of individual biological macromolecules in biologically relevant conditions (in particular in fluid at room temperature) has made the SPM an exciting addition to the biophysicist's tool chest. Despite its successes in biology, the pinnacle of SPM precision and performance has only been achieved in highly isolated, nonbiological environments. While such high-precision instruments have led to outstanding research and iconic images in nanoscience (e.g., the quantum 'corral'),(1) they are operated at cryogenic temperatures and surrounded by nested layers of vibration isolation in unoccupied, temperature-regulated rooms. These levels of largely passive isolation are necessary to minimize a major noise source in SPM, i.e., unwanted mechanical drift between scanning-probe tip and sample. Drift occurs in all scanning-probe instruments owing to environmental perturbations. When operating such instruments at liquid-helium temperatures, the gold-standard conditions for high-precision SPM work, tip-sample drift rates are reduced to ~0.01Å/min. This extreme instrumental stability facilitates detailed dynamic studies and enables atomic-scale patterning of matter. In recent work,(2) we showed that it is possible to approach similar levels of tip-sample stability in ambient, 'real-world' operating conditions, where instrumental drift rates are typically 1000-fold higher. Mechanical drift between an SPM tip and a sample limits many aspects of SPM performance. For example, atomic-force microscopes (AFMs), the most prominent type of SPM instrument, would benefit from the ability to enhance image resolution by scanning slowly and averaging cantilever response, return the tip to a precise feature in an image (e.g., a region of a protein), hover the tip over a feature for long time periods to study local dynamics (e.g., conformational fluctuations), and precisely control the tip's 3D position when disengaged from the surface (e.g., force spectroscopy). Unfortunately, none of these important tasks can be achieved with current AFMs in real-world conditions because of drift. Long-term atomic-scale stability between tip and sample is needed to fully exploit the advantages of AFM across a broad array of disciplines. To surmount the limitations imposed by drift, we have developed a unique, ultrastable AFM measurement platform. Our approach, inspired by precision optical-trapping techniques,(3) establishes a local differential reference frame to control the tip/sample displacement (see Figure 1). 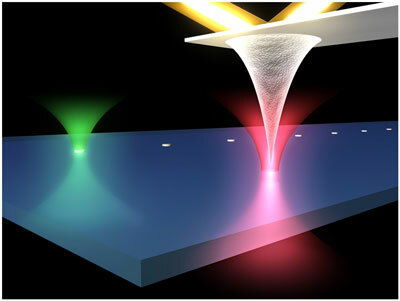 Briefly, focused lasers of different wavelengths (red and green) locally report tip and sample position by scattering off both the tip's apex and a fiducial mark (a nanoscale silicon disk) affixed to the sample plane. Backscattered light is separated by wavelength and collected to yield the 3D position of each object with atomic precision. This data is used as feedback to piezo stages (not shown) to actively stabilize the tip's position with respect to the sample. The technique's precision hinges on maintaining extreme 3D differential pointing stability between the two laser focal volumes. The method requires low laser power (1mW), is independent of tip/sample interactions, and negligibly perturbs the tip. A third laser (gold) is reflected off the backside of the cantilever to report tip/sample force in a standard optical lever-arm arrangement. Conceptually, we have developed a robust 'tripod' for AFM measurements. Our work extends the full use and precision of this widely used tool to a variety of real-world operating conditions. For example, we recently extended our ultrastable AFM's capabilities to room-temperature fluid to study proteins in biologically relevant conditions. Although preliminary, we have already uncovered interesting new phenomena in the unfolding and re-folding dynamics of bacteriorhodopsin, a model membrane protein. We anticipate that the newfound capabilities of ultrastable AFM will find applications in a variety of fields ranging from fundamental studies in single-molecule biophysics (which we will continue to improve on) to tip-based nanofabrication. 1. http://www.almaden.ibm.com/vis/stm/corral.html; The quantum 'corral.' Accessed 3 July 2010. 2. G. M. King et al., Ultrastable atomic force microscopy: atomic-scale stability and registration in ambient conditions, Nano Lett. 9, pp. 1451, 2009. 3. L. Nugent-Glandorf, T. T. Perkins, Measuring 0.1nm motion in 1ms in an optical microscope with differential backfocal plan detection, Opt. Lett. 29, pp. 2611, 2004.